In my recent EDC pocket dump article, I mentioned that I carry a USB flash drive on key ring. It is a GorillaDrive, and has proven extremely rugged - true "hard use gear," in my opinion. I actually have three. In addition to the one on my keychain (32 GB), I also have two (64 GB each) that I keep in my bug out bag. I will explain exactly why I really like my GorillaDrives later in this review, but first let me describe how I use them. The Gorilla on my keychain is my everyday workhorse flash drive. I keep a backup copy of my important personal papers and pictures on it (encrypted with Rohos software which I downloaded myself), lists of family & friends, along with their contact and other information, maps & driving directions to assorted destinations I may need, music files (you gotta have some fun), and various videos and .pdf files relating to survival and prepping, as well as my work & school related files. Since it is on my keychain, it goes wherever I go. The two GorillaDrives I keep in my bug out bag contain a backup of the files on my laptop's hard drive, which I update monthly. That way, if I ever have to bug out without my laptop, I've still got all my files. One word: rugged. Two words: extremely rugged. I've had the GorillaDrive on my keychain for almost 3 years now. Between school and work, it has been used daily, often multiple times each day, during those three years. 've dropped it countless times, onto carpet, hardwood flooring, tile, cement, dirt, gravel, and even asphalt parking lots. I've carried it in freezing weather, raining weather, and very hot weather. I even left it outside overnight once (by mistake) when the temperature was in the mid 20s. Despite frequent and hard use for almost three years, I never once have had my GorillaDrive fail or even a single file lost or corrupted. 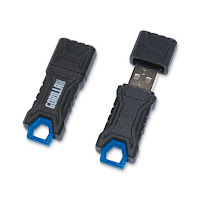 The GorillaDrive is designed for hard use - they call it "ruggedized for extreme durability." It is made from a special silicon compound with a metal loop, and is designed to be pressure/impact resistant (up to 250 psi), heat resistant (up to 225 degrees F), and water resistant (up to 65 feet). Although they don't list freeze resistance, as I said mine did survive outside overnight in below freezing weather, and I've carried in in even colder weather. And it lasts (again, for almost three years and counting).